School dress codes have gotten seemingly more stringent in recent years and Moultrie Middle School, in South Carolina, is no different. When 12-year-old, Reese Franyo, went to school last week, she had no idea her outfit—including a denim skirt— would be deemed inappropriate by school officials. Franyo, who’d been sent to the principal’s office to call her mom for a change of clothes, had first been shamed in front of peers by a teacher for the outfit. The teacher apparently claimed she looked as if she should “be clubbing” and yes, we’re just as confused as you are because she looks great! The school’s dress code has a policy, stating the skirt must be five inches above the knee so when Franyo’s mom, Suzie Webster, arrived and measured on her own accord in front of the principal, the skirt was found to be in conduct with the rules. It’s long been discussed how dress codes seem to focus mainly on the female population and this is another example of everyone needing to chill out and let the girl wear her denim! The principal agreed to let Franyo wear the skirt but by this point, she was too embarrassed and we would be, too. Instead, she changed into the clothes, pants, Webster brought, though we really feel for Franyo. The shaming understandably angered Franyo’s mother. She took to Facebook to vent. Everyone has different body shapes and it is sad to think that girls who may be more developed are called out because of how they look in their clothes, this is just plain wrong. Shortly after, on Franyo’s birthday, Webster posted a similar, yet more encouraging photo. Happy Birthday to my funny, outgoing and happy Reesie Peesie. In honor of your 12th birthday today we are going "clubbing." I love you! 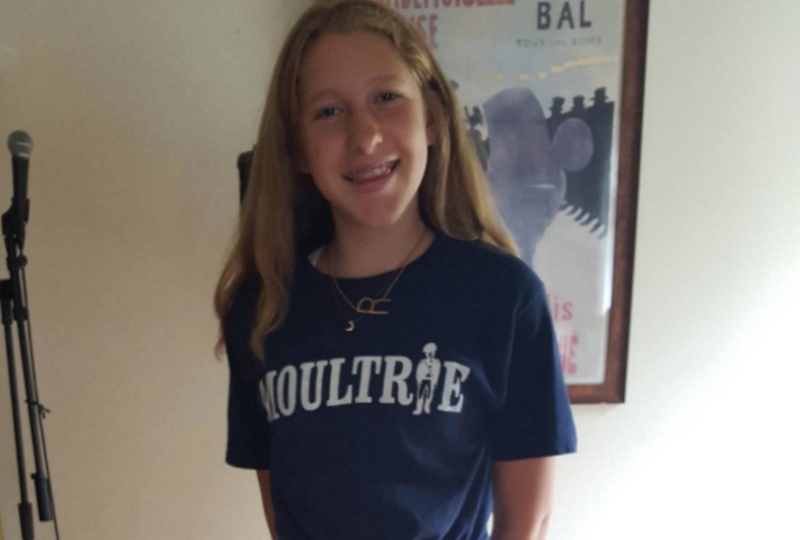 "Please know that it is not my intention to hurt Moultrie Middle School or Principal Ryan Cumback, but merely to draw attention to how important it is to raise our girls up and fill them with confidence. I do understand the need for a dress code, but there is a better way to handle enforcement. Let's keep working on this together in a fierce, but positive way." We only hope that, aside from addressing this incident, Moultrie Middle School, and others, take a page from Suzie Webster’s post and stop tearing girls down for what they’re wearing, but instead, focus on instilling the self-esteem and confidence they deserve.